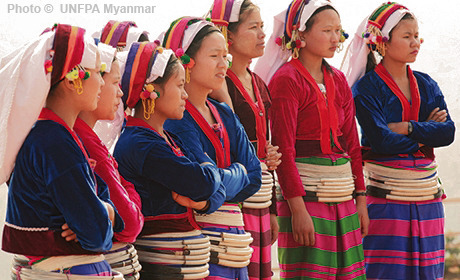 With abundant natural resources and a dynamic population, Myanmar still faces slow economic growth. Health system weaknesses have kept maternal mortality high, with a majority of deliveries taking place at home, unassisted by skilled birth attendance. UNFPA support began with the 1973 national census. Current programmes align with national plans on reproductive health, HIV/AIDS and women’s rights. They focus on extending high-quality reproductive and sexual health services, emphasizing HIV prevention. UNFPA assistance also helps expand capacities to produce high-quality demographic data, and conduct research and analysis on gender equality issues. WAINGMAW, Myanmar – When Dr.